“Book To The Future: Time-Travel Message In A Capsule” from Christian Faith Publishing author Larry S. Buford is a history-based, faith-based account demonstrating how what people do and allow today will impact tomorrow. Larry S. Buford explains why the faithful need to stop lowering their standards. “Book To The Future: Time-Travel Message In A Capsule”: a call to live up to the standards set by God and to inspire a better future for all. 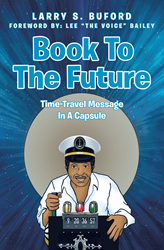 “Book To The Future: Time-Travel Message In A Capsule” is the creation of published author, Larry S. Buford. In addition to his writing skills, Larry has a keen ear for music. In 1978, Detroit music producer Ken Sands and a rock group called The Buzztones recorded one of his songs, “Believe In Me.” At the time, Larry was writing children’s stories, but decided to exclusively write songs after he witnessed people dancing to the song at a live concert. Although raised in the Christian faith and baptized at an early age, Larry had a true spiritual awakening that changed his priorities after his six-year-old son died in a tragic traffic accident in 1979 and his half-sister was murdered nine months later. Larry then established his own Watchman Record label and DerShawn Music Publishing Company, named after his son, in Detroit. Larry also sang in an R&B group and produced shows at different venues around the city. In 1984 Larry signed an exclusive songwriters contract with Motown Records of which he is very proud of. In 1985, Larry received a call from none other than the late great Ray Charles. He was later told Mr. Charles had actually recorded some of his songs, but they have yet to surface. Mr. Charles did, however, send him a recording for his grandmother Martha Porties’ ninetieth birthday celebration. In 1995, Larry was fortunate enough to get Scherrie Payne, formerly of The Supremes, to record several of his songs. In 2001, two of the songs “(Going) Back To Motown” and “(Let’s) Make Time For Love” were released on Larry’s label and shipped to Detroit in time for Detroit’s three-hundredth birthday celebration. Paralleling his music career, Larry maintained a successful twenty-five-year career in various office management positions from which he honed his business-writing skills. Today, Larry continues to write humanitarian commentaries, articles, and reviews for various newspapers and online publications, including the Los Angeles Sentinel, The Michigan Chronicle, The San Francisco Bay View, Kalamazoo’s Community Voices, The Compton Herald, The Compton Bulletin, Lee Bailey’s EURweb.com, and YourNews.com. He has also had comments and quotes published in the Los Angeles Times and the Detroit News. His self-published book and CD, “Things Are Gettin’ Outta Hand,” is available on Amazon.com. He is also delving into fictional short stories and script writing. A diligent researcher, one of Larry’s favorite mottos is “next to knowing is knowing where to find out.” In 2012, Larry appeared in the David Ruffin episode of TV One’s “Unsung.” He also appeared in a blues documentary entitled “Hot Love on Me So Strong!” by Kari Fretham in 2014. In May of 2016, he released his first album, “One More Time,” a CD compilation of songs he has recorded himself. Published by Christian Faith Publishing, Larry S. Buford’s new book is an attempt to hold the conditions of modern times up to the light of truth and reestablish standards for all times. Just as ancient mariners relied on the North Star, mankind has to find a guiding light for its moral compass. People are being misled to do what is right in their own eyes instead of God’s eyes. There are thousands of different church denominations and doctrines. Every one of these denominations claim to have the right answers over all the others. Instead of aspiring to higher standards many churches are conforming to the world by loosening the standards set forth by the Word of God. What one generation does in moderation, the next does in excess. The more people continue to lower God’s standards as set forth in the Bible, the faster they descend into immorality. One must contemplate whether or not anyone in the future will even know what His standards truly are, let alone be able to help others re-calibrate. The Bible is to us what the owner’s manual is to a car. Those who want to prosper, need to read it, live by it, and encourage others to do the same. It is the only way to make a better future. View a synopsis of “Book To The Future: Time-Travel Message In A Capsule” on YouTube. Consumers can purchase“Book To The Future: Time-Travel Message In A Capsule” at traditional brick & mortar bookstores, or online at Amazon.com, Apple iTunes store, or Barnes and Noble. For additional information or inquiries about “Book To The Future: Time-Travel Message In A Capsule”, contact the Christian Faith Publishing media department at 866-554-0919.